Simultaneous multi-user remote management and control of up to 16 PCs, servers or KVMs at the BIOS level. The SV1653DXI 16 Port Enterprise class CAT 5 Matrix IP KVM Switch provides multi-user control of connected servers, devices and services connected through a local network infrastructure. Multi-user functionality allows 1 local user, 1 IP user and 1 remote console user (with a console extender device - SV5CONS not included) to simultaneously access three different systems connected to the KVM.The IP KVM switch allows users to reboot the system, access the BIOS and have full control over the keyboard and mouse as if they are on site, saving time and resources by providing complete remote control of connected equipment.Aside from a dependable and convenient operating platform, the SV1653DXI IP KVM Switch also provides features that are essential for secure and efficient management of mission-critical servers and devices - day in and day out.Note: The following interface modules are required for host connectivity: SV5USBM - USB Server Interface Module for the Enterprise Series IP KVMs; SV5PS2M - PS/2 Server Interface Module for the Enterprise Series IP KVMs. The SV1653DXI 16 Port Enterprise class CAT 5 Matrix IP KVM Switch provides multi-user control of connected servers, devices and services connected through a local network infrastructure. Multi-user functionality allows 1 local user, 1 IP user and 1 remote console user (with a console extender device – SV5CONS not included) to simultaneously access three different systems connected to the KVM. The IP KVM switch allows users to reboot the system, access the BIOS and have full control over the keyboard and mouse as if they are on site, saving time and resources by providing complete remote control of connected equipment. 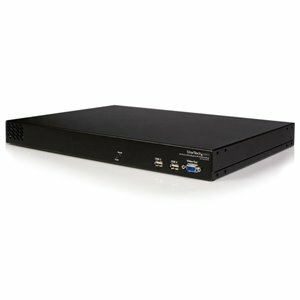 SV1653DXI IP KVM Switch also provides features that are essential for secure and efficient management of mission-critical servers and devices - day in and day out.